I did it! I finished Argosy before it finished me! Okay, I still need to weave in the ends and block it, but I don't have to knit it anymore. I am so tired of ripping that scarf back to fix errors. 1. 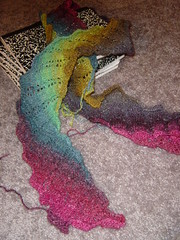 There were several knots in my Noro Silk Garden Lite, so I have more weaving than I want. 2. Umm, I can't think of anything else. 1. I became more comfortable with certain techniques like the cable cast on and ssk. 2. The Noro holds it own, so if I made a mistake, I didn't have to tink, I could rip back with no worries. 3. I look darn good in this scarf. Since I finished my waiting for meetings project, I pulled out a WiP. I started working on Hermione's Cable and Bobble Hat. 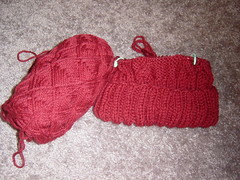 Although I love knitting hats, I got bored doing the ribbing, so I stopped abruptly. Well, while waiting for my lab meeting today, I finished the last 15 ribbing rounds (Another Ribbed Scarf got me in shape for this). I have gotten into the interesting part now. I have to admit that I really like cable work. I even enjoy an occasional bobble or two (never on a sweater though...::shudder::). I find cables and bobbles so magical, because you make them simply by "making mistakes:" twisting the order of stitches and knitting the wrong way.